David Headley Names Pakistan’s ISI; Is 26/11 Still ‘RSS Ki Saazish’? David Headley, alias of Daood Syed Gilani, the Pakistani-American terrorist who conducted detailed reconnaissance of various Mumbai locations in preparation for the deadly terror attack on the night of 26 November, 2008, has clearly exposed the central role of the Pakistani State and its premier spy agency, ISI, in that attack. As per this Quint report, David Headley made a number of revealing confessions, directly implicating Pakistan’s premier intelligence agency ISI (Inter Services Intelligence), on record during the first day of his video deposition to a Mumbai special court. Headley confesses that he was ‘handled’ by ISI’s major Sameer and Iqbal. Lakshar-e-Taiba leader Zaki ur Rehman Lakhvi’s handler was ISI’s Brigadier Rivaz. Pakistan’s intelligence agency Inter Services Intelligence (ISI) Chief Shuja Pusha visited Lakhvi after his arrest in Pakistan Occupied Kashmir. Headley confessed to having visited 5-6 militant training camps in Pakistan. He attended Daura-e-Suffa, Daura-e-Amma, Daura-e-Khasa and Daura-e-Ribat leadership courses, during the course of which he met Zaki-ur-Rehman Lakhvi and Hafiz Saeed. Public Prosecutor Ujjwal Nikam said that when asked what ‘jihad’ meant to Headley, the latter said that ‘jihad’ meant fighting the enemies of Islam. Headley was taught in the training camps that Bharat was an enemy of Islam. Headley also said that all terror groups work under United Jihad Council & their aim is to orchestrate attacks in Bharat. 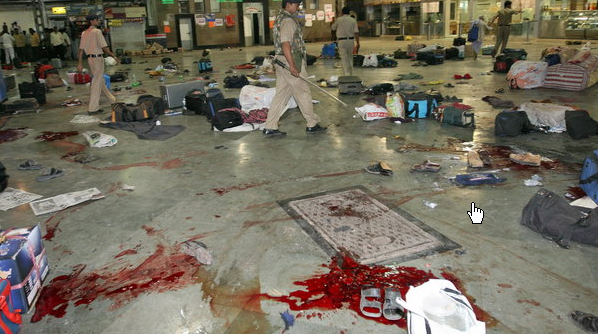 Bloodbath at CST Station, Mumbai during the 26/11 attacks. On the night of 26 November 2008, 10 members of Lashkar-e-Taiba, an Islamic terrorist organisation based in Pakistan, carried out a series of 12 coordinated shooting and bombing attacks lasting four days across Mumbai. The attacks killed 164 people and wounded at least 308. Only one of the 10 terrorists, Ajmal Kasab, survived the attack. He confessed upon interrogation that the attacks were conducted with the support of the Pakistan government’s intelligence agency, the ISI. Kasab was hanged in Yerwada jail, Pune in 2012. Sources have quoted Kasab telling the police that the group received help from Mumbai residents. David Headley’s was born as Daood Syed Gilani to Sayed Gilani, a well-known Pakistani diplomat and broadcaster, and an American mother on June 30, 1960. Gilani went on to attend the elite Cadet College in Pakistan, a boys’ military prep school. He was brought up by his father as a devout Muslim in Pakistan and moved to USA at the age of 17. In 1998 Headley was convicted of conspiring to smuggle heroin into US from Pakistan. He served less than two years in jail and then went to Pakistan as an undercover informer for US’ Drug Enforcement Administration. Around 2000, he came in contact with Pakistani terror organization Lashkar-e-Taiba (LeT, translated as ‘Army of the Pure’), and in 2006 changed his name to David Headley at the insistence of his ISI handlers, to hide his Pakistani ancestry and pass as a Western tourist. In June, 2006 he established a branch office of his friend Tahawwur Hussain Rana’s (an ex-Pakistani army doctor) immigration business in Mumbai. Between September 2006 and September 2007 Headley made eight visits to India, and conducted reconnaissance to aid the plotting of the 26/11 terror attack. During these visits to Mumbai, Headley lived the high life and befriendedRahul Bhatt, the son of Bollywood director Mahesh Bhatt, who guided him through the city’s party scene. Headley’s second and third wives had warned American officials of Headley’s involvement with LeT and his plotting attacks, warning specifically that the Taj Mahal Hotel may be their target. This information was ignored. In October 2009, Headley was arrested at Chicago airport after a visit to Copenhagen to help plot the terror attack on the office of Danish Newspaper Jyllands-Posten, that published cartoons of Prophet Mohammed. Headley was sentenced to 35 years in prison by a US court in Jan 2013 for his role in the 2008 Mumbai terror attack. Documents released by WikiLeaks show that the US has classified ISI as a ‘terror affiliate’. Those who believe that Pakistan’s dispute with Bharat is limited to Kashmir alone should read the book ‘Fighting to the End: The Pakistan Army’s Way of War’ which shows the deep-rooted Pakistani view of Bharat as an enemy in perpetuity. But despite this mountain of evidence against the Pakistani State which uses terror as an instrument of state policy to hurt Bharat, influential members of our polity continue to act as Pakistan apologists, and prevent the emergence of a clear-sighted doctrine to deal with this existential threat. This constituency of Pak apologists chiefly gained strength during the UPA era. In 2010, a book named “26/11 : RSS ki Sazish” written by Aziz Burney (Editor-in-Chief of leading Urdu newspaper ‘Roznama Sahara’) was released by Congress General Secretary, Digvijay Singh. The book claims the RSS and BJP are behind the 26/11 terror attack. Other notable luminaries, some of whom appear in TV studios as the ‘moderate’ Muslim face, seen at that book launch were Maulana Mahmood Madani, Jamiat Ulema-e-Hind general secretary & Rajya Sabha MP; Mahesh Bhatt, Bollywood Director; K Rehman Khan, Congressman & Deputy Speaker, Rajya Sabha; Meem Afzal, former ambassador and journalist; Qalb-e-Jawad, Shia leader; and Maualana Tauqeer Raza, prominent Barelvi cleric. The book launch was moderated by Akhtar-ul Wasey, director of the Zakir Husain Institute of Islamic Studies at Jamia Millia University. To this day, Congress President, Sonia Gandhi, has not condemned her leaders like Digvijay Singh for their endorsement of a book that indirectly aids an enemy state, Pakistan. Congress, and particularly key Sonia appointee & Union Home Minister P Chidambaram, ensured the term “Hindu Terror” / “Saffron Terror” gains wide currency; ironically in an era when Bharat is one of the biggest victims of Islamic terror. And if the negationism by pseudo-seculars for what has happened in front of our eyes is so strong, imagine what they have done with history. And the dubious role of many in media is also something that should ideally be addressed through a probe by investigative agencies. However, our intelligence appartus, which was wrecked by UPA and others, seems to be regaining some strength – as can be seen in the recent NIA crackdown on ISI & ISIS terrorists and their collaborators across Bharat. But unless we develop the collective will to see Pakistan for what it is, a terror State masquerading as a civilized nation, we will continue to bleed.